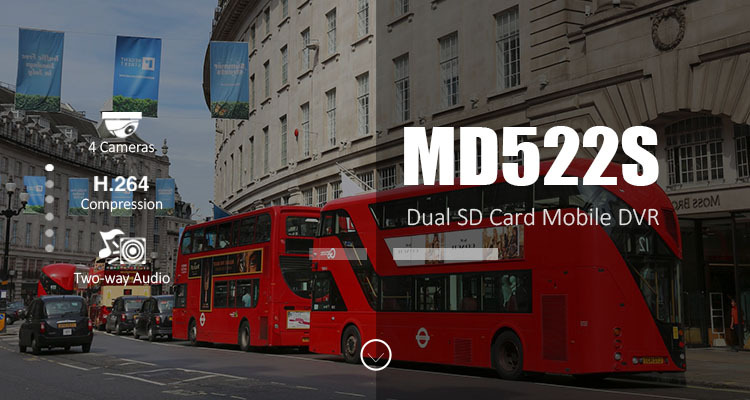 The MD522S adopts H.264 video compression/decompression, GPS positioning and wireless data transmission technologies, and constitute an important part of new-generation wireless vehicle video surveillance system. The unit features the highest resolution and frame-rate combination available, delivering outstanding image quality with the most advanced video storage technology (H.264). And it is perfect for monitoring vehicles that need continuous video surveillance, such as buses, long-distance coaches, taxis, logistics vehicles, armored cars, private cars, and almost every type of commercial vehicles. At present, there are 2G, 3G and 4G devices available for clients. The MD522S can be installed with dual SD cards. Once connected to a network (2G/3G/4G), it can monitor up to four separate cameras at one time and provide video recordings of all the activities in and around your vehicles. Recorded videos can be searched and played back based on the channel, recording type, or time. The device is equipped with a built-in G-sensor(accelerometer), which logs and displays G-force data, allowing fleet managers to monitor driver behaviors including harsh acceleration, harsh braking, speeding, turning left, turning right, idling, etc. In addition, multiple users can simultaneously and securely have access to live or recorded videos from the MS03 platform through their smartphone or tablet anytime and anywhere. In addition, remote PC clients can securely reach device functions via a web browser. Users can also customize a virtual geographic boundary and will be alerted if the vehicles travel out of range. Apart from the geo-fence alert, they support SOS, speeding, cornering, blind spot, and video signal loss alerts. If you desire more functions, you are allowed to connect multiple peripherals, including the fuel level sensor, temperature sensor, RFID reader, iButton reader, LED display, etc. Learn more about the MD522S.